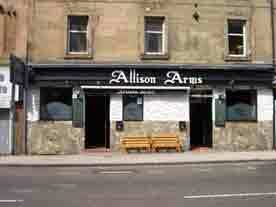 718 Pollokshaws Road, Glasgow. G41 2AA.Tel: 01414231661. Established in 1884, the first landlord was Charles Smith Gall, he was also famous in the city as an auctioneer and valuator, trading under the name of Charles Smith Gall & Co. in West Nile Street. In 1898 George Scott took over the licence, George had another pub the Garrick Vaults at the corner of Main Street and Rutherglen Road, Gorbals. Scott went bankrupt and James Denholm took over the business. Mr Denholm played a leading roll in the trade Defence Association when the area when dry in 1920, Denholm fought against the local veto campaign and nine months later the pubs were opened again. Another well known publican to hold the license for this pub was John Flynn, the Flynn family were well known in the licensed trade having the Springfield Vaults London Road and the Old Straw House Gallowgate, Parkhead. The roughcast exterior stands out like a sore thumb, however this is a great local selling fine cask conditioned beers and holds a large number of single malt whiskies. The original U shaped bar still survives and so does the carved gantry. If you like looking at yourself in the mirror this pub has a cracker advertising William Younger's ales. Another well known publican to run this popular south side establishment was John Haxon jun, who was licensee during the 1930s and 40s. Had 18 pubs in 1919. In 1990 there were 12. Pollokshaws went dry in 1920 during the local Veto campaign, 9 months later the pubs were once again opened, this was achieved by the members of the Trade Defence Association.